One of our favourite stones at Kernowcraft is opal, there are so many different varieties and the incredible colour play in these wonderful stones makes each one so unique. Our passion for these stones is clear when you browse through our rather large collection of these stones! Opal is a speciality in its own right; there are many different varieties of contrasting values, from common opal to precious opal. On this page we share information about the variety of different opals as well as give our best tips advice on how to care for them. Opal can be quite a delicate stone so some understanding of the nature of the stone will be useful and care should be taken when setting. Care should also be taken of your opal jewellery once set - avoiding contact with harsh cleaners or chemicals which could affect the stone. We also look at the myths surrounding opals as well as how to identify the fake ones. Opal is a form of silica, chemically similar to quartz but containing water within the mineral structure. Precious opal generally contains between 6 – 10% water and consists of microscopic silica spheres arranged in a regular pattern. It’s these silica spheres that determine the colour of the opal - large spheres create reds and small spheres go through the spectrum of colours with the smallest creating blues. It has a hardness of 5.5 – 6 on the Mohs scale. Australia produces over 90% of the world’s precious opal with some of the most famous mining areas including Coober Pedy, Lightning Ridge, Yowah, Quilpie and Koroit. Other countries such as the US, Mexico, Ethiopia and Peru (amongst others) produce precious opal and fancy varieties of common opal. Opal falls under two main varieties: precious opal or the 'opalescent opal' and the common (potch) opal. Their physical properties vary considerably and there are many varieties of each type. There are also a variety of opal options that have been put together by different man-made processes. Ethiopian opal first came on to the market in 1993, although there are records of it being used by early cave men in Kenya. It was rediscovered in the early 90’s in the Shewa Province of Ethiopia. A new deposit near the Wollo Province was later discovered in 2008 and has been producing opals of a higher quality. Ethiopian opal comes in a variety of colours, from white, yellow and orange to dark red and chocolate brown, which varies between translucent and opaque. The play of colour is the same as other opals, coming in every colour of the spectrum. Ethiopian opal is hydraphane opal, the term comes from the Greek words meaning 'water loving' as the stone is porous and will absorb water which can change the stone from opaque or semi-translucent to transparent - this can sometimes highlight the colour play or if it becomes completely transparent no colour play will show at all. This behaviour is typical of the stone and you may notice the stone looks different in different weather, depending if the atmosphere is very damp or dry. The good news is that tests by GIA and others have shown that opal from the Welo province in Ethiopia will revert back to its original state, once dried, with no adverse reaction such as cracking. It is part of the stones nature to change in appearance and absorb water but you may wish to take precautions to keep your Ethiopian opal jewellery out of water when washing or doing household chores to help to prevent changes to the stone or it absorbing perfume, cream, soap or cleaning products which could stain or change their colour. 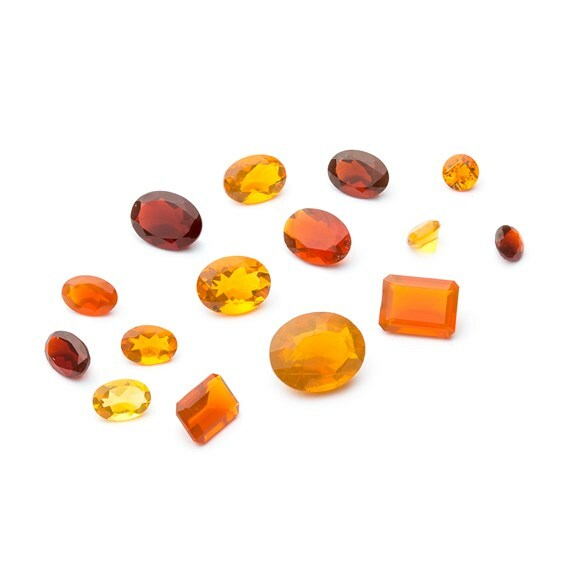 Fire Opal is translucent and ranges in colour from bright red, orange, yellow to transparent. As it has no play of colour it is technically a common opal, however, with its strong colours it can be a stunning and valuable variety of opal. The term ‘boulder opal’ covers three sub categories of opal which are all formed in sandstone and ironstone: The most common is Boulder Matrix, which comes from the fields of Yowah and Koroit in the South West of the state where beautiful ‘pictures’ are created between the matrix (the host rock) and the opal that entwines around it creating little works of art. 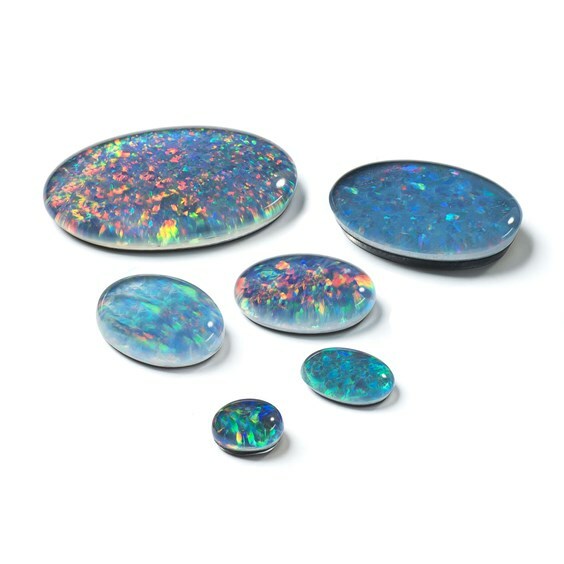 The rarest of all three is Opalised Wood (this is the cutters favourite type of boulder opal). This forms in roots of wood where the matter decomposes leaving gaps where the opal, a combination of silica and water, trickles into it. 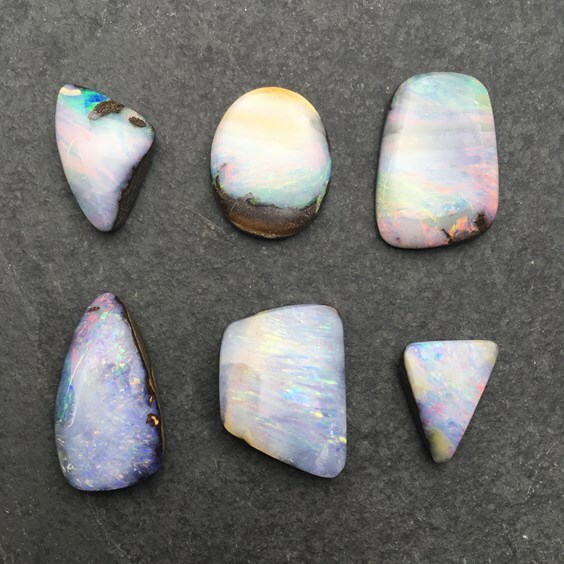 Over a process which takes millions of years, unique patterns are formed between the opal and the fossilised wood. Click here to view our boulder opal information page. Black opal is predominantly mined at Lightning Ridge in New South Wales, Australia, which is world famous for its black opal. More has been mined there than at any other location in the world. The name black opal refers to the distinctive black ‘background colour’ or ‘body tone’ and not the play of colour present in the opal. 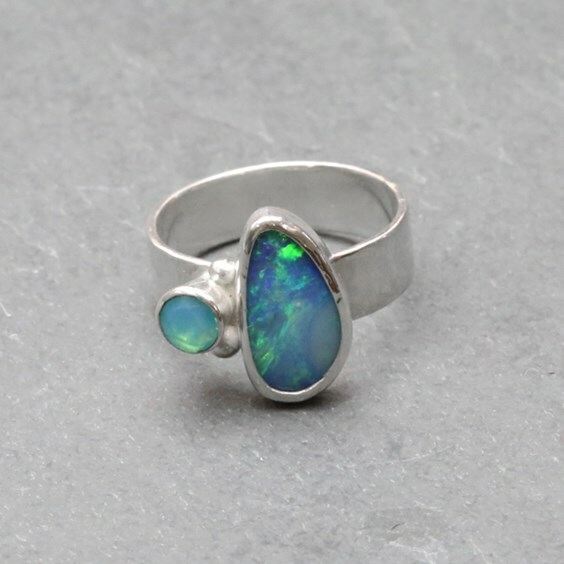 Black opal often has a natural layer of potch left on the back of the stone which can give the stone extra darkness and therefore a more vibrant play of colour - which gives them their higher value. Because of their vibrancy of colour, black opal is more valuable than clear opal or white opal. Semi-black opals are also known as dark opal or grey opal and cover any opal which is too dark to be classed as a white opal, but aren’t dark enough to be a black opal, these mostly come from Lightning Ridge. Solid opal is exactly that; it consists entirely of opal material without any other host rock and can be a combination of both precious opal and common opal. White opal is the most commonly available type of opal and is therefore less valuable than boulder opal or black opal. However, it is still extremely beautiful and can exhibit all the colours in the spectrum with some stones fetching over £100 per carat. Opal doublets consist of a very thin slice of precious opal that has been cemented on top of either common (potch) opal or another host rock. As some opal has very thin but brilliant layers of fire, this can give doublets extremely beautiful colour. Due to the nature of the doublets, care must be taken when setting them as the edges can be vulnerable to chipping and you should avoid prolonged exposure to water as this will eventually cause ‘lifting’ between the layers. 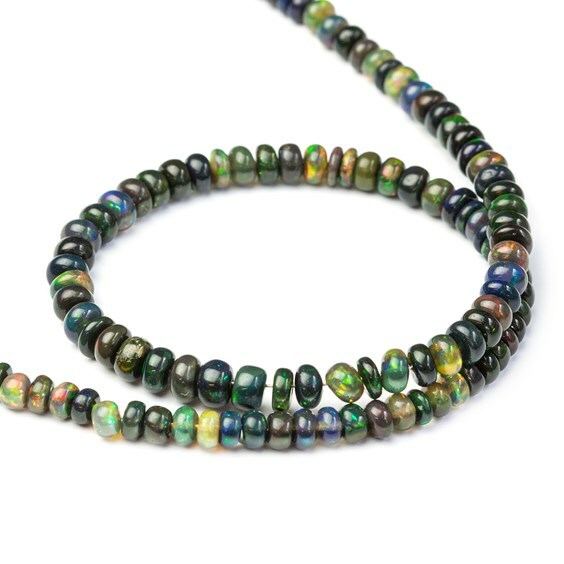 Opal triplets are similar to opal doublets, as they are made up of layers. As the name suggests they have three layers, a black stone backing, a slice of opal in the middle and a domed piece of crystal quartz or glass on the top. Our opal triplets are capped with natural quartz (making them more hard wearing than opal doublets) and much better quality than those capped with glass that can be prone to chipping. You should avoid prolonged exposure to water as this can eventually cause ‘lifting’ between the layers. 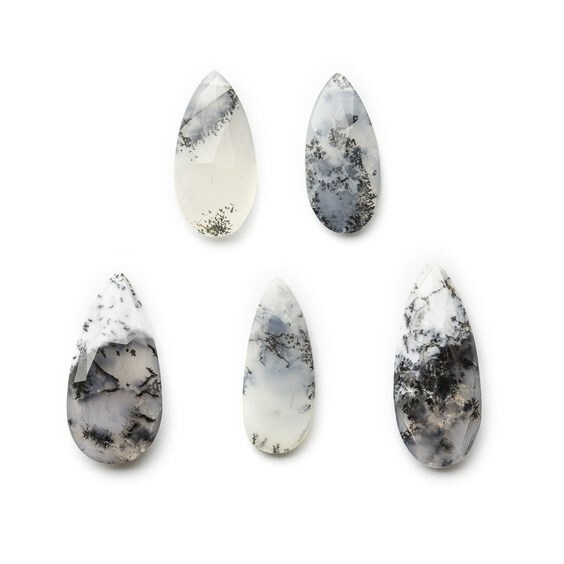 Dendrite opals have no fire but the milky white material is punctuated by delicate natural fern/tree like black and grey markings of manganese oxides. The stones are often reminiscent of a wintry forest. The complex patterns in contrasting black and white are quite amazing and each very unique in their patterns. Peruvian blue opal is relatively rare and is only found in the Andes mountains near San Patricio, Peru. It is the national stone of Peru. 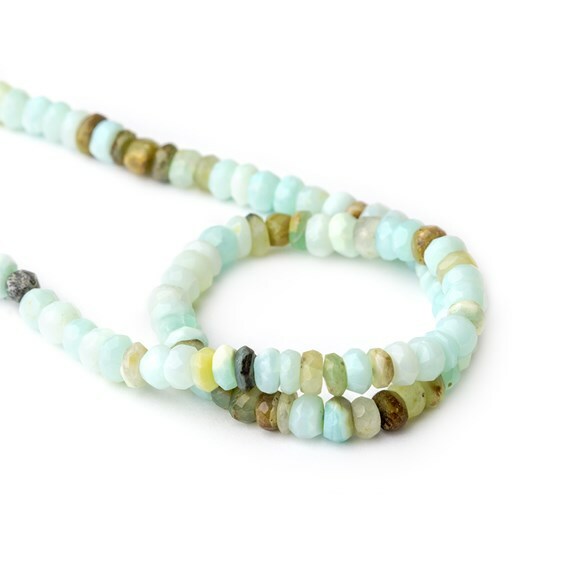 Peruvian opal is a translucent stone with colour similar to the beautiful tropical Caribbean Sea. Depending on how the stone is cut it can be clear, scenic (showing varying degrees of colour) or dendritic which has black fern like inclusions. Unfortunately, in recent years dyed stones have been sold by dealers as Peruvian Blue Opal. Dyed stones are quite common and sell very cheaply at gem shows and on internet auctions. You can sometimes tell if a stone is dyed if the blue colour is uneven. 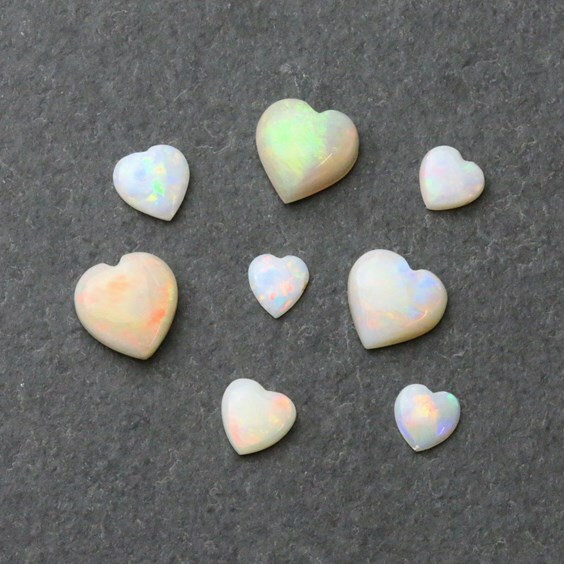 Opals are quite a delicate stones so having a good understanding of the type of opal you would like to set by taking into consideration its cut and shape and the type of setting it is most suited to will ensure you get better results. Opal doublets for instance can be particularly delicate as the layer of opal is quite thin and doesn't have a protective quartz layer like an opal triplet. Boulder opals come in a wide variety of types as well as shapes and sizes. A long, thin stone for instance will be more vulnerable than a smaller, rounded and deeper stone. Care should be taken to ensure that the back of the stone is stable and the setting will support it evenly when you come to set the stone. One useful tip, particularly for long, narrow, thin stones is to use some Devcon 5 Minute Epoxy Glue under the stone to fill any gaps and create a stable base in the setting. Take into consideration the type of jewellery and the setting style, a bezel setting for instance will provide more protection to the edge of the stone particularly in a ring setting where it could be more vulnerable. As opals are one of the more delicate stones they do require some care and understanding of the nature of the particular stone. 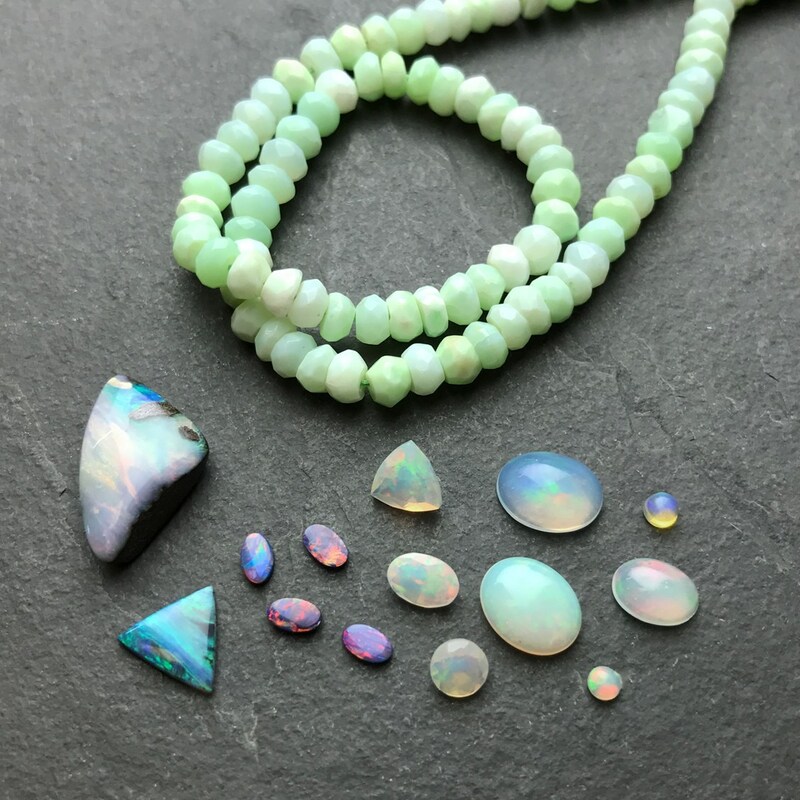 There are a few reasons that make opals quite delicate, firstly, they are relatively soft gemstones (between 5.5 and 6.5 on the mohs hardness scale), they contain water so can be susceptible to cracking if they dry out too much in a very low humidity atmosphere. Hydraphane opal like Ethiopian opal can also change in appearance and loose its fire if it absorbs too much water (though if dried out it should return to normal). Opal triplets and doublets are made from layers of stone glued together so repeated contact with water can weaken the glue or cause water to seep between the layers and cause a cloudy appearance. Don't put opals in an ultrasonic cleaner and avoid contact with things like bleach, chemicals and cleaners. OPAL MYTHS: ARE OPALS REALLY BAD LUCK? Opals were once believed to be bad luck (some people still believe this to be the case), but you can date this rumour back to a number of possible causes. One, is that Sir Walter Scott published a novel in the mid 1800’s called Anne of Geierstein, where he used an opal to reflect the changing fortunes of the heroin. Book critics thought that the opal had an evil influence due to some of the heroin’s misfortunes (although this was never the intention of the author) – a myth that dramatically reduced the value of opal at the time! It is also said that the rumour of opals being bad luck was started by diamond merchants in the mid 19th and early 20th centuries once they realised that opal was a serious threat to the diamond trade. Opal was being commercially mined and was increasing in popularity, however, the ‘bad luck’ myth soon damaged the reputation of opal. Another myth is that opal is a fragile gemstone and so it’s bad luck to wear. At 5.5 – 6 on the Mohs scale it is a similar hardness to turquoise, lapis lazuli and labradorite and is harder than malachite and fluorite. 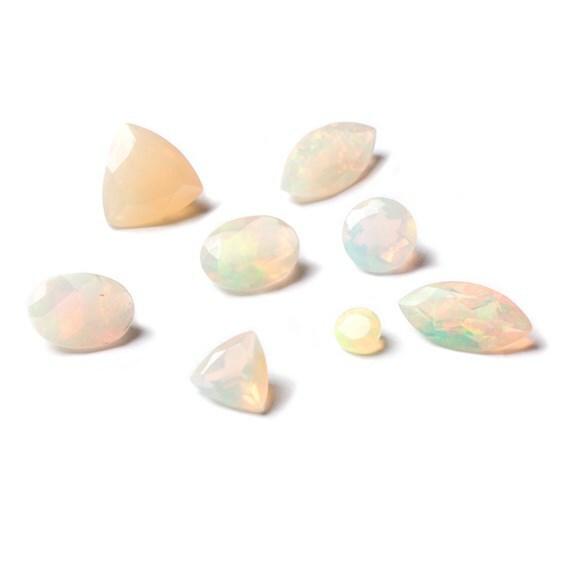 So yes, we wouldn’t recommend wearing an opal when gardening, playing sports or similar, but they’re actually not as fragile as some people believe. Remember that in Australia they say the only bad luck about opal is not owning one! Synthetic opals (such as Gilson Opals) are made from the same chemical composition as natural opals (hydrated silicon dioxide), so they have a similar structure to that of a precious opal, but they are produced in a laboratory. Synthetic stones can look like genuine opal, but often show brighter colours with colour patches being much larger than those found in natural opal. The colour grain boundaries are generally highly irregular in synthetic opal and within each colour grain there are numerous sub-grains producing a distinctive snakeskin pattern. They also generally show a more ordered array of colours since artificial material doesn’t duplicate the intricate pattern of natural opal. Imitation opal is a non-opaline material (so not the same chemical composition as natural opal) often set in clear plastic or epoxy resin. 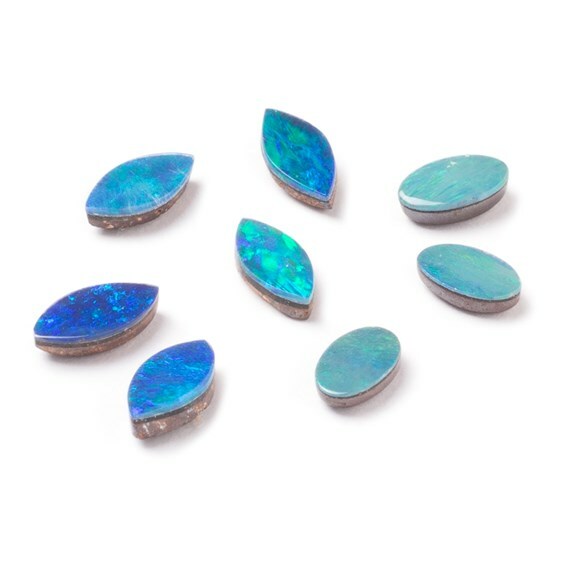 These are much easier to distinguish from natural opal as they usually have a pearly opalescence rather than a play of colour, with opalite probably being the best know imitation opal. Opalite: There are two very different stones on the market called Opalite. The lesser know is a variety of common opal which contains moss like inclusions, whereas the other (and the far better known) is a man-made product made of glass which is often miss sold as opal or even moonstone. We have seen opalite being miss sold as a genuine gemstone far too often, and sometimes where the seller is genuinely unaware that they are incorrect (perhaps where they themselves bought it as a 'genuine gemstone') so please beware and always buy from a trusted supplier. If you have any other questions please feel free to get in touch, we would love to hear from you!